Anaheim Bio Shield Disposers are a leader in food waste disposers because of quality, reliability, and state-of-the-art product features. Our garbage disposers fit neatly under the sink, leaving space for kitchen items. They are surprisingly quiet and use little electricity and water. ; smaller and lighter than most other disposers because of their space age high tech components. They guarantee heavy-duty performance and provide important space saving benefits. that are small, light, efficient, and powerful. The high torque motors produce 2600 to 2800 rpm eliminating virtually all jams before they can happen.
. Its compact, robust, lightweight materials provide for easy and speedy installation. for easy cleaning and replacement and all of our disposers are septic safe. in four easy steps. Simply feed in the food waste together with water from the cold water tap. The motor drives a turntable that spins and pushes the food waste against a stationary grind ring. In seconds, the food waste is quickly reduced to small particles which are then flushed through small holes in the grind ring, through the normal waste pipes to the treatment plant. Our food waste disposers have been built to resist the major cause of disposer failure—corrosion. The grind chamber and the drain housing are both CORROSION PROOF. 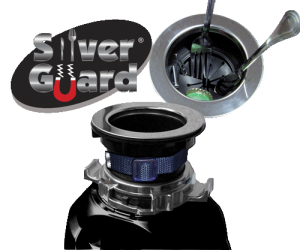 Our disposers feature OVERLOAD PROTECTION to protect and ensure longer life of the motor, a lifetime corrosion proof guarantee, and more torque than other disposers. of a Anaheim Bio Shield disposer and see why Built-In Quality makes our disposers the best in the world. Anaheim Bio Shield is the only food waste disposer treated with Bio Shield Antimicrobial. Bio-Shield Antimicrobial provides protection against bacteria-caused odors. Anaheim Bio Shield is the only disposer with Bio Shield®, a unique antimicrobial agent, permanently molded into the “wet” components of the garbage disposer to eliminate bacteria-caused odors. It also inhibits the growth of a wide range of microorganisms. The only food waste disposer with the Torque Master® grinding system. Features balanced turntables and balanced armatures as the heart of the system. This, along with corrosion proof components provide for less vibration and longer life. 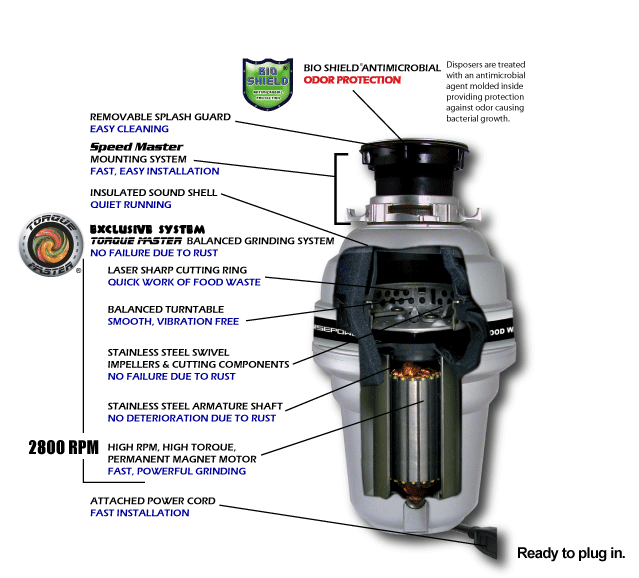 All Anaheim Bio Shield disposers have modern, permanent magnet motors that are smaller, lighter and more efficient than the old, slow and heavy induction motors. These high torque motors produce 2600 or 2700 rpm virtually eliminating jams before they can happen. 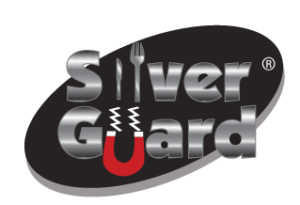 The Deluxe and Premium models on most brands come with Silver Guard® protection. The magnetic Silver Guard captures most metal objects before they enter into the disposer chamber. This protective feature helps prevent damage to valuable cutlery. It also helps prevent damage to the disposer as well as expensive repairs caused by metal objects falling into the disposer.